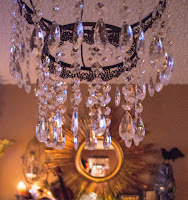 Entertaining Grace: 2015 Halloween House Preview! Urgh! I swear the weeks are going at double speed. Now that we're in the build up to Christmas, my guess is they'll only go faster from here on out! In preparation for this year's Halloween party, I have about 8 projects in progress. My living and dining rooms kinda make me look like I'm about a half a step away from going full Grey Gardens. I'm hoping to have things almost completely pulled together by the beginning of this next week, but for now, I wanted to give you a sneak peak of how it's starting to shape up. 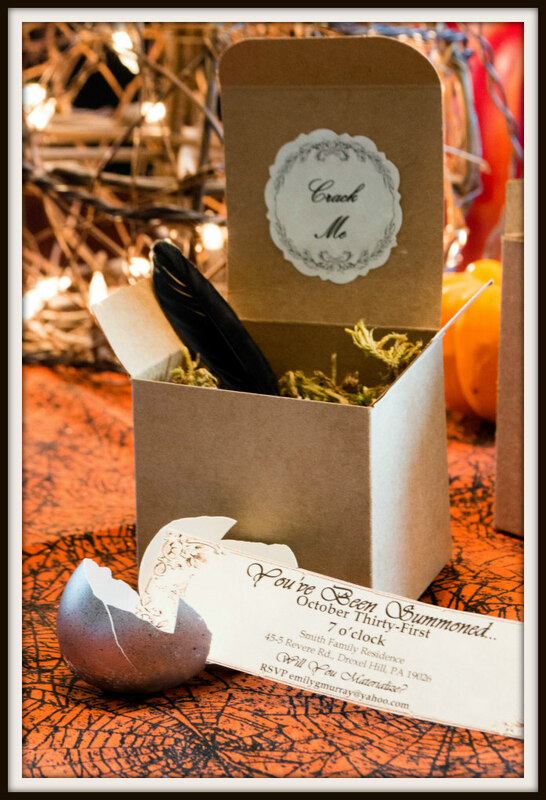 My fabulous Interactive Halloween Invites (which I'm pleased to say received rave reviews) set the scene for a spooky raven filled cemetery theme. 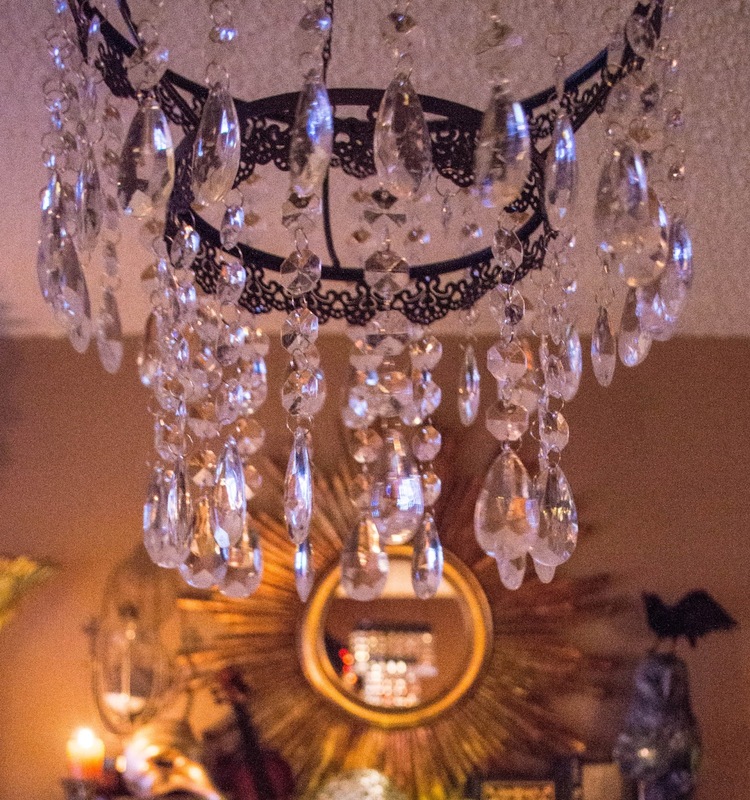 As this may be one of the last opportunities for a grown up celebration, I'm taking full advantage by prepping for a glam All Hallows Eve seated dinner. 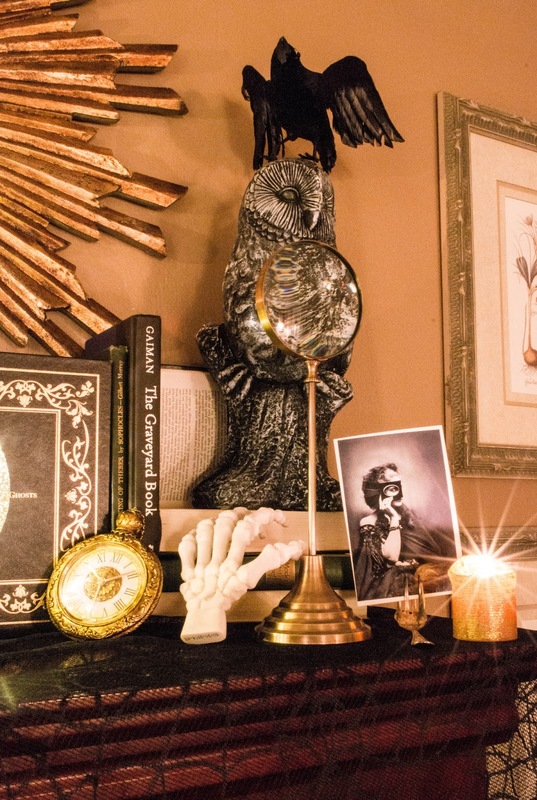 The mantel is almost always where I start. I tend to feature some of my favorite pieces, identify a theme and build out from there. 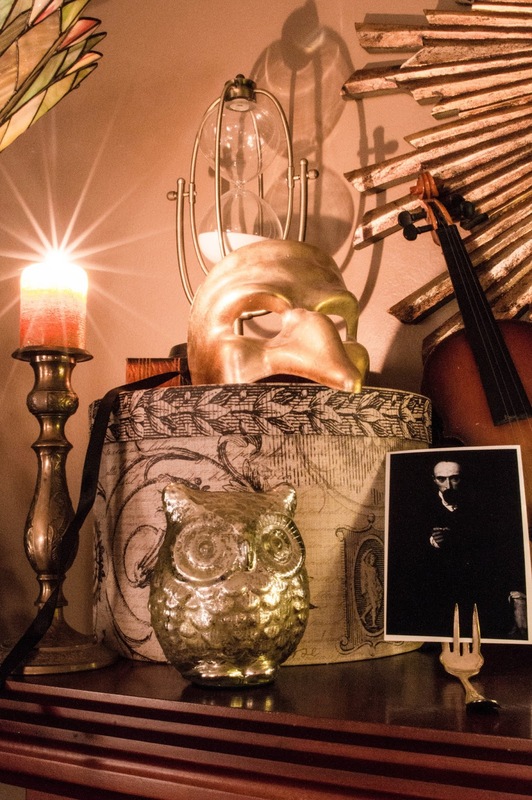 An old hat box, props up a brass hour glass, my old violin and a gold pantalone mask. Instead of going with traditional frames, I bent some castoff forks up to feature some creepy photos I found on the internet. 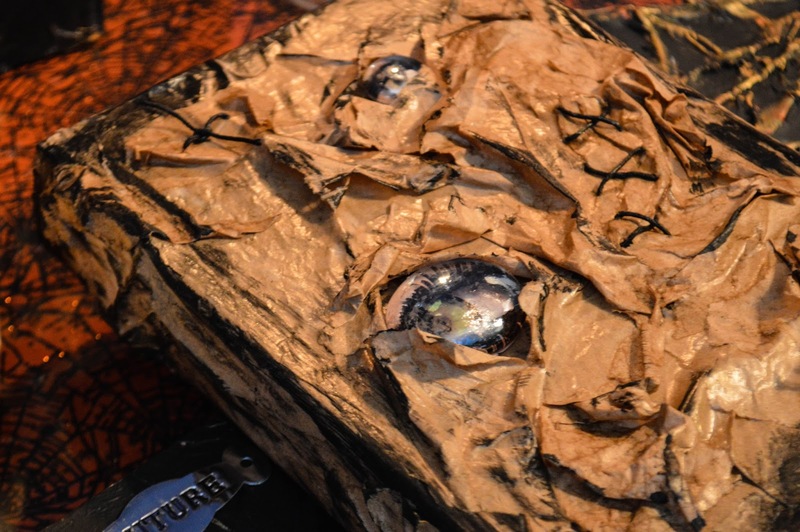 Old books feature in almost every Halloween display I do. I love the idea of disembodied words, thoughts and stories all whispering from their haphazard stacks. A stone owl looks on with the first of the black birds residing over top. And how cool is that photo? 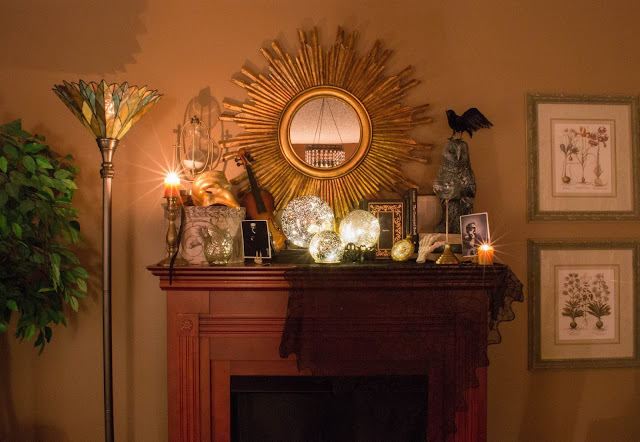 The centerpiece of the mantel is a set of gold garden lamps that are lit from within with lights that twinkle. Though they're meant to be suspended, I detached their chains and found bases for each of them. 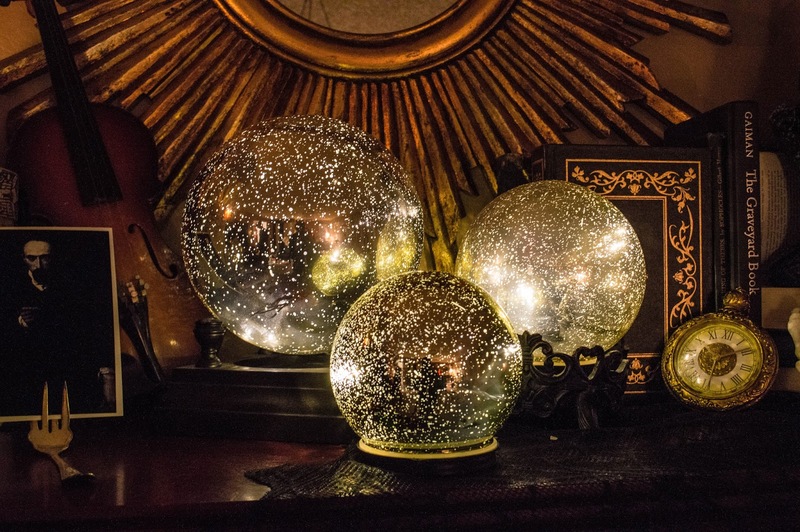 They remind me of crystal balls and magic. I love them! The small demilune by the front door brings the outdoors in with a large gnarled branch weighed down by a webbed vase of gourds and pine cones. 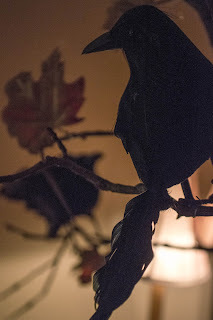 The arms of the branch are festooned with gold leaves and a flock of black birds in various stages of flight. Yup. I just said "festooned." Deal with it. 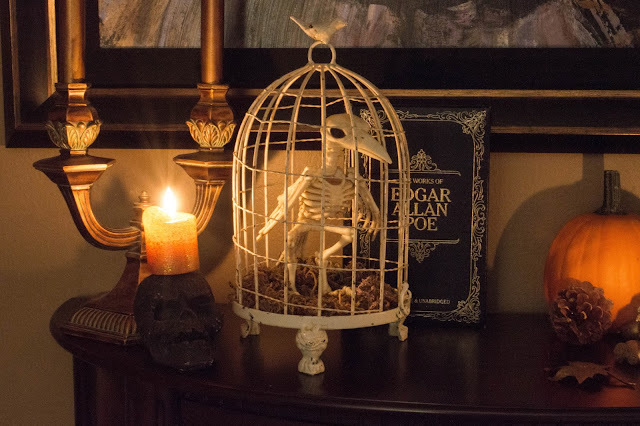 A drugstore purchase, this bony fella gets the spot of honor in a domed cage. He might feel a little less excited about his containment. 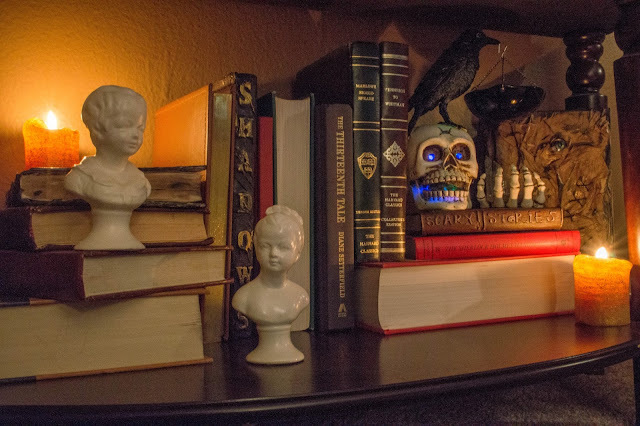 Stacks of books, tiny busts, gold candles and a Yankee Candle raven topped skull fill the bottom of the demilune. 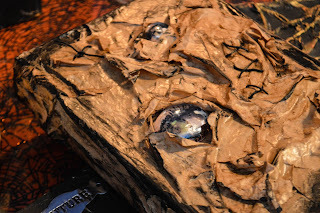 (For a tutorial on making Spooky Halloween Books, click here). The most recently finished spot is the French script table in the dining room. 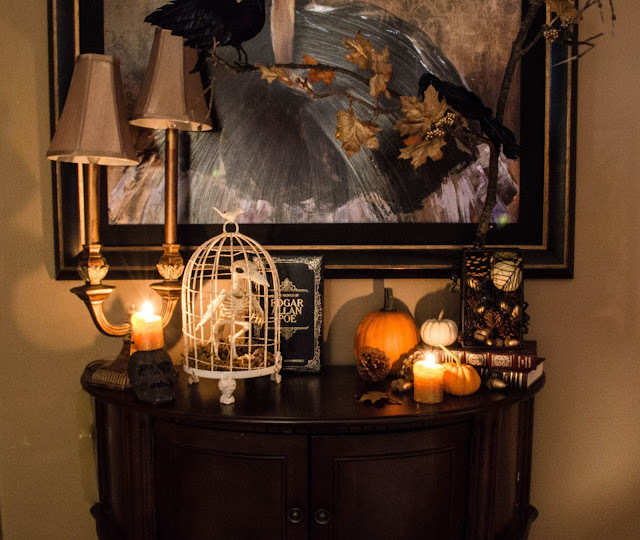 I love creating unique vignettes rather than simply featuring store-bought props. 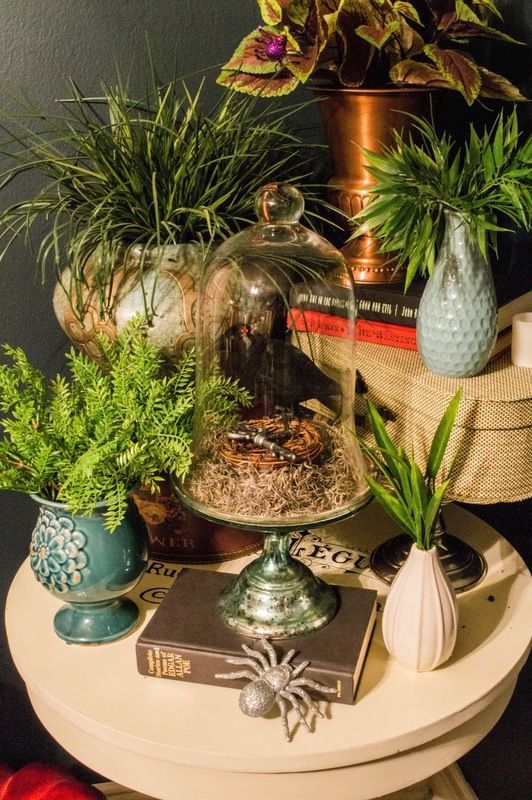 Among old luggage, books, and various plants, I added a bird, nest and skeleton key to a cloche-topped mercury glass cake stand. As soon as I bring in the wrought iron fences, tombstones and giant Chinese lantern paper moon I'm working on I really think the room will start to take shape. I have So Much More to do in the next few days, but every year it manages to come together somehow. I'll be out of town, visiting with family, for the next few days, so it may get a little dicey toward the end, but, hey, nothing like a little extra pressure to inspire! Have a fab week and hopefully I'll have more pics soon!